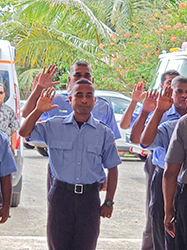 Pohnpei—This morning the Pohnpei Department of Public Safety activated its 911 Emergency Communication Center and administered the Oath of Service to 19 firefighters. The firefighters are also trained Emergency Medical Responders (EMR) and the station is now manned 24 hours a day, seven days a week. Firefighters and EMRs are also on duty 24 hours a day, seven days a week. 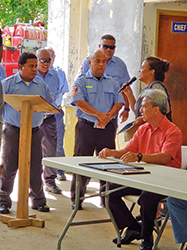 What the ceremony this morning means for Pohnpei is that it from this time forward, it will be easier for residents to access emergency services, both medical and police, and that response time should be faster. Besides the oaths of office and the official opening of the 911 center, a highlight of the ceremony was the presentation of an award to Firefighter Joseph Ainstein. Ainstein received the award for actions he took on November 25. EMRs were dispatched to the area of the public market in response to a call about a drowning victim. When they arrived the victim was on shore and was not breathing. Ainstein performed a set of chest compressions that were unsuccessful. During the second set of compressions she began to breathe and to cry. Ainstein and his partner Dalferd Perez transported her to the hospital where she was treated on an emergency basis. The 911 system has already resulted in at least one rapid response that meant that one home did not burn down when it easily could have. At approximately 8:30 on the evening of December 8, the day after the 911 center officially opened, the 911 dispatcher received a call about a fire burning inside a home near the Kolonia Community Health Center. He dispatched firefighters who arrived and put out the fire which had been caused by a butane gas stove. “The home owners are very fortunate that the neighbors called in on time, otherwise the fire could have set the rest of the house on fire,” said Chief Patrick Carl. It’s just the kind of response that the Department of Public Safety had hoped for. Chief Carl said that it works on cell phones as well, even if the cell phone has no credits left on it. While people should not hesitate to use the system there are also some things that they should know, said Chief Carl. The 911 emergency system is for currently happening emergency use only, Chief Carl said. For instance, if you come home to find that your house has earlier been burglarized, it would be better to use the phone number 320-8633 to report the crime rather than 911. But if, for example, there is an ongoing machete fight outside your home, or if someone is in medical distress and needing immediate medical attention, Pohnpei residents should not hesitate to use the 911 system. Residents need to know as well that when they call, the dispatcher has a list of questions to ask in order to assess what services need to be dispatched. As soon as they know enough in order to dispatch the proper emergency responders they will ask the caller to remain on the line while they alert the proper responders whether those are law enforcement, fire, EMRs, or all three. The dispatcher will then return to the line to continue to ask questions in order to aid in the continuing emergency response. They will need to know the caller’s phone number and name in order to have continuing contact with them. All of this is so that responders can get rolling as quickly as possible and so that they can continue to receive information even as they are responding to the scene of an emergency. Dispatchers use a computerized system to aid them in their dispatch decisions with tabs for many different types of emergencies that lead them to different sets of questions to ask the caller. All of them designed to give the best type of emergency response DPS can provide. The 911 system has three lines that roll over to the next available line to the dispatcher if any are busy. That process is transparent to the caller. Also, phones within the center are programmed for single button contact of the various emergency response units in Pohnpei. They also have radios, one for on island response and one for the outer islands in the event that phones at the response units go unanswered at the time of an emergency. Chief Carl wanted to be sure that people understand that the 911 system is an emergency response dispatch number at the Department of Public Safety and is completely unrelated to the 411 telecom phone directory service. Apparently, since the service opened dispatchers have received calls from confused callers who want to know a phone number. Chief Carl said that the International Organization for Migration also provided funding for a new radio tower that has eliminated many of the areas where radio communication had previously been impossible. There are still many areas in Pohnpei where radios cannot be reached but Carl said that DPS hopes to find funding to continue to eliminate those areas through the use of repeaters.